Tina's Crop Shop: A Paper Pumpkin Thing Blog Hop - A Sara Thing Kit! Hello and welcome to A Paper Pumpkin Thing's very first Blog Hop! This is a monthly Blog Hop dedicated to Paper Pumpkin Alternative cards and projects! As a non-demo Paper Pumpkin subscriber, I was thrilled to be asked to join in this hop! There are seriously some Rock Star Stampers among us! 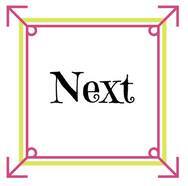 If you've started at my blog, please make sure you hop all the way through so you won't miss anything! If you've already been hopping, you should have landed from my friend, Megan's blog and thank you so much for continuing! Before we get to my card and project I have something very important to share....We have a Blog Hop Give Away! To be entered into a drawing for a FREE "A Sara Thing" Paper Pumpkin Kit, you must leave a comment on EVERY blog. Drawing closes on Saturday, April 29th at 9PM EST. The winner will be announced on Monday, May 1, 2017. This is such an awesome kit, I am so excited that one of you will win one! Here is my card and project for you.. I decided to sponge instead of watercolor the emboss resist. I used a sponge and Stampin' Up! Melon Mambo to apply the color. I decided it was a little too bold in places so I used my Aqua Painter to add some water and mellow out some of the ink blending. I then cut out that portion and used it on the bottom left of a 4" x 5 1/4" piece of Watercolor Paper. I stamped my sentiment in the upper right and stamped the splatter stamp three times above the Melon Mambo resist. I added some of the Washi Tape in the very upper left corner. Last but never least I added three of the flowers, each with two of the leaf stickers. Glue Dots were used to adhere the flowers. I topped the flowers with a Rhinestone Jewel and then added three other random Rhinestones. These coordinating envelopes are just perfect to use for Mini Treat Bags. 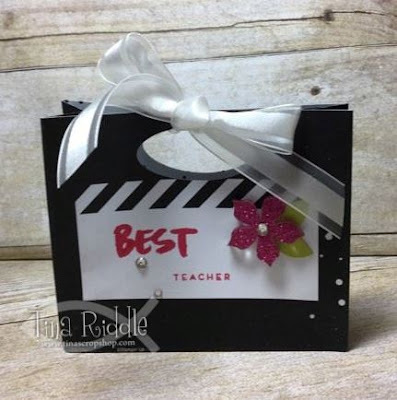 So I shared about a month ago how to make these little treat bags out of a regular A2 envelope. If you missed this post you can read it here! Basically, it's simple to do and if you have a small treat and need a little bag, this works just perfectly. 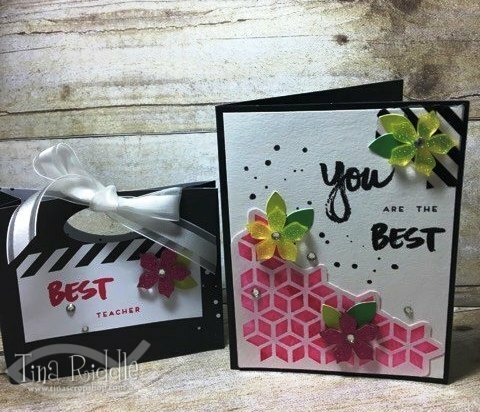 I stamped my sentiment on the envelope and used my oval dies to cut out the oval hole prior to cutting, scoring and shaping into a treat bag. Thanks so much for stopping by today! The next stop on the hop is Cindee Wilkinson, just click the next button and you'll be there! Very nice alternative ideas - TFS! Melon Mambo is my favorite! I like your projects a lot! The contrasting colors on the card really make the MM pop! Love the flowers! Looks like spring! Such fun ideas! I love how you used the flowers! Too cute! Again, another great idea using envelopes! I need to experiment more lol! So cute! Love that bag! I'm almost finished hopping and I'm exhausted! So many lovely ideas. Thanks for sharing yours. I need to make those bags!!!!!!! Thanks for the "how to." Love, love, love the mini treat bag! Can't wait to go make one!!! What a great gift set for a teacher. How could they not feel special with packaging like this? Great idea! Cute mini treat bag! Great for end of year gifts! Love the bag with matching card. Thanks for the treat bag tip. I had forgotten all about it. Love your card! I have to CASE that if you don't mind! Your card is beautiful and love the treat box. 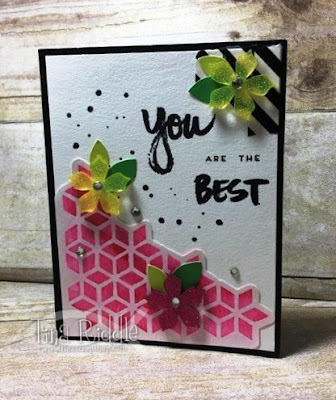 Beautiful colors on the card - love how you cut out the flowers on the background to make it a little more polished. The treat bag is really cute also. great bag and card love the colors! Great bag and the colors are just the best!! Oh my! Such awesome creations!!! OMG! I've been making bagelopes for years, and I never thought to turn it on its side to use as a mini tote bag! Thank you! And I love how the address area of the envelope fits perfectly on the front. I have to go make one right away! And your card is very pretty, too! I LOVE the treat bag, so cute! Mellon Mambo is one of my favorite colors and sponging it on the watercolor paper looks so bold and beautiful! I like the washi tape in the corner which gives it balance. Such a nice looking card!